Kepco's TMA are power supply controllers to program, control and monitor the output of up to 27 Kepco power modules in the MAT, MST, MBT and BOP series at distances up to 1000 feet. 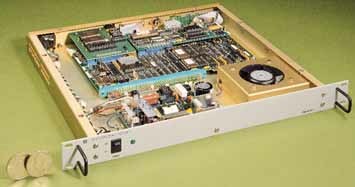 The Kepco TMA 4882-27 controller receives commands and transmits data to a host computer over the bi-directional digital control bus IEEE 488.2 or over a serial communications link using RS 232. Kepco's 'Digital Highway' illustrates the interconnection of Kepco Products, including the TMA 4882-27 Controller. Kepco model TMA 4882-27 supports both CIIL (Control Intermediate Interface Language) and SCPI, the Standard Commands for Programmable Instruments. The controller continuously monitors the status of each power module for the correctness of the programmed voltage or current, overvoltage, overcurrent, crowbar, overtemperature, power loss, output enable and polarity reversal status and other fault conditions. Any changes from normal set conditions will generate error flags reported over the communications bus. For catastrophic failures, a separate 2 wire status monitor line (also known as discrete fault indicator) is activated for fast direct communication with the host computer.